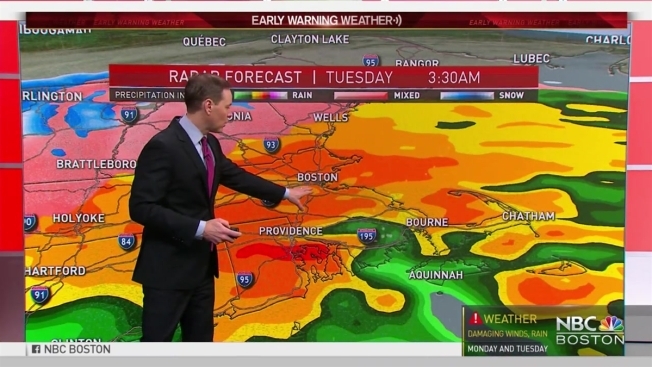 Today on NBC Boston, you’ll notice our weather graphics have “gone red.” This red look is something our viewers and web users will come to recognize in the weeks and months ahead, as it represents our NBC Boston Early Warning Weather Team’s promise to you: to alert you appropriately when impactful weather threatens a large segment of our population. Our Early Warning Weather Alert system is not hype, nor sensationalism – rather, it is a promise to our viewers for ease of use: knowing whether impactful weather is on the way is as simple as turning of the TV and checking to see if our weathercast is in red. Our promise goes deeper than that, however, as our team is committed to spelling out exactly why and exactly when the Early Warning Weather Alert is effective for, and you’ll see that information at the start of each newscast when an Alert has been declared. Behind the scenes, our team of nine meteorologists has worked together to agree on impactful weather parameters that serve to trigger these alerts, and we all operate off the same, specific criteria, so our viewers can be assured that no matter who is working, no matter when it is, our alert protocol will be consistent, reliable and trustworthy. This particular storm has looked strong and impactful from several days out, and as it’s neared, our team has highlighted Monday evening through Tuesday morning for an Early Warning Weather Alert. The reasons: heavy rain overnight Monday night into the Tuesday morning commute, and damaging wind gust potential exceeding our threshold on both Cape Cod and scattered through Eastern and Central Massachusetts. The heavy rain will result in some ponding of water on roadways, possible brief urban street flooding, and a risk of hydroplaning on area highways, dropping 1.5 to 2 inches of rain with some locally higher amounts. Wind gusts from the northeast will exceed 50 mph at times predawn Tuesday in Eastern New England, but along the immediate coast – particularly on Cape Cod and the Islands – gusts will likely hit 60 mph early Tuesday. By mid-morning Tuesday, most of the action will be tapering to breezy showers. Though not focused on the bulk of the Boston area, our Early Warning Weather Team at both NBC Boston and necn is also quite concerned about an ice storm for Northern, Central and Western New England. From the Eastern slopes of the Berkshires along the northern Route 2 corridor of northwest Massachusetts and into Northern Worcester County points northward through Vermont, interior New Hampshire and Maine, enough cold air should hold for a storm composed of significant sleet (ice pellets) and freezing rain. It’s worth noting: a sleet storm and a freezing rain storm pose very different threats. In Northern Worcester County and adjacent South-Central New Hampshire, the risk of a freezing rain event overnight Monday night is greatest – raindrops falling into subfreezing air and freezing on-contact with the ground and objects on it. Continued freezing rain results in a thickening ice glaze that can coat untreated roads, but in areas with treated roads has a bigger impact by accumulating on power lines, increasing the risk of power outages by Tuesday morning, particularly when winds kick up, and can encase cars in a glaze of ice. Farther north, though 1”-3” of snow may fall from Manchester, NH, northwest along Interstate 89 into Vermont with 3”-6” possible in the higher mountainous terrain, the bigger concern by far is an extended period of sleet overnight Monday night into Tuesday morning. It’s always a tough call between sleet and freezing rain, but it does appear cold air remains deep enough in much of Northern New England – including Central New Hampshire – for raindrops aloft to refreeze to ice pellets (sleet) in the final couple of thousand feet of descent. The impacts of sleet are different from freezing rain – because sleet is ice pellets falling to the ground, there is less concern with accumulating glaze on power lines and more concern with the pellets of ice acting like little ball bearings on roadways and walkways, decreasing traction for drivers and pedestrians, alike, and eventually accumulating enough to be packed into a sheet of ice that becomes increasingly difficult to treat on roadways and highways as it accumulates and packs down. It’s important to note the different between making sleet and making freezing rain is sometimes only several hundred feet of cold air, so these sleet areas should also make preparations for possible power outages in case freezing rain should fall instead.